I have a bit of an obsession with gnocchi. It’s the perfect meeting of my two loves: potato and pasta. My waistline wishes my fondness was for protein shakes or celery or whatever but no, its gnocchi, and I’ve been in love with these delightful little dumplings since I was tiny.I always preach about trying new things but when I see these little parcels of heaven on a menu, I can’t resist. I would love to try them everywhere, Sam I Am. I’ve been lucky enough to have gnocchi in Italy (not everywhere but in a few places, such as Venice) and each region of Italy has it’s own interpretation so I’d love to go on a Grand Gnocchi Tour of Italy one day. The best I’ve ever had though was in Croatia. I actually thought this was bizarre but it’s not; it’s an extremely popular dish in coastal Croatia (such as Split, where I had the best one); they call it “njoki” (sounds the same, I guess). It was in a tiny little port-side cafe where I sampled this best-gnocchi-dish-of-my-life-so-far. So simple, perfect little morsels tossed in a Gorgonzola sauce. I didn’t even like blue cheese at the time, but after this dish I became a convert, which tells you a little something about it’s power. Anyway, unfortunately I am not currently overseas on gnocchi-consuming adventures. I did however have a lovely weekend in South Australia’s very own McLaren Vale, sampling the local produce (particularly the wine!). I absolutely love living in Adelaide because McLaren Vale, the Barossa Valley, the Clare Valley and the Adelaide Hills region are all so close, and the Coonawarra is a few hours’ drive away. These amazing regions are home to some of the world’s best vineyards and microbreweries and the freshest produce. We went to a restaurant called Au Pear (so cute, check it out here) and I had, of course, the gnocchi. The menu reads: “house made with confit artichoke hearts, caprino fresco and olive cream”. Now, strictly as a gnocchi traditionalist, it wasn’t what I expected. I have to day though, it was delicious. So delicate, so balanced, so fresh – and just enough on the plate to start feeling full without feeling heavy. Maybe that was the idea – we ordered the lemon souffle for dessert! 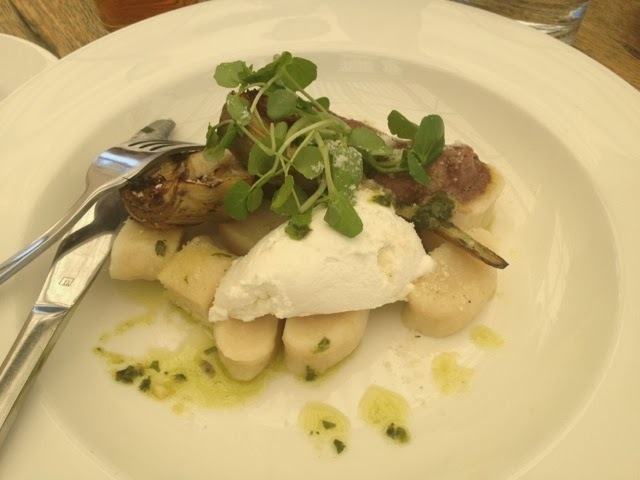 So, if you want a relaxing afternoon in the sunshine, head down to the Vale for some beautiful food; if you’re somewhere else in the world right now, keep me up to date with the gnocchi on your plate! Gnocchi, Au Pear restaurant, McLaren Vale – sorry, I dug in before I remembered to take a photo! I would say the best I’ve had was a very simple dish, fried in brown butter, at the Vanitas Restaurant in the Palazzo Versace hotel on the Gold Coast.Super expensive and stuff… but it was worth it! So delicious. Surprising, as I’m not much of a fan of gnocchi. 😉 That plate looks yum though, should check that restaurant out while visiting the parents-in-law. oh do check it out, it’s beautiul!